In the years of 2010-2012 we had finished an intensive archaeological fine-cleaning of almost all preserved antique surfaces of the Forum. 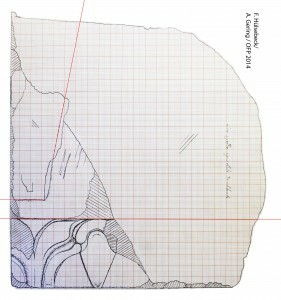 The main aim of the 2014 campaign was to document these surfaces including the „missing link“ – that is: the south end of the Forum (see plan and picture below). Therefore, we had once again invited our dear collegues from the German Aerospace Centre to record our previously excavated areas from 2012 by 3-D-photogrammetry and laserscanning. Since 2010, we had proceeded from the Forum’s east side to the north and to the west side. 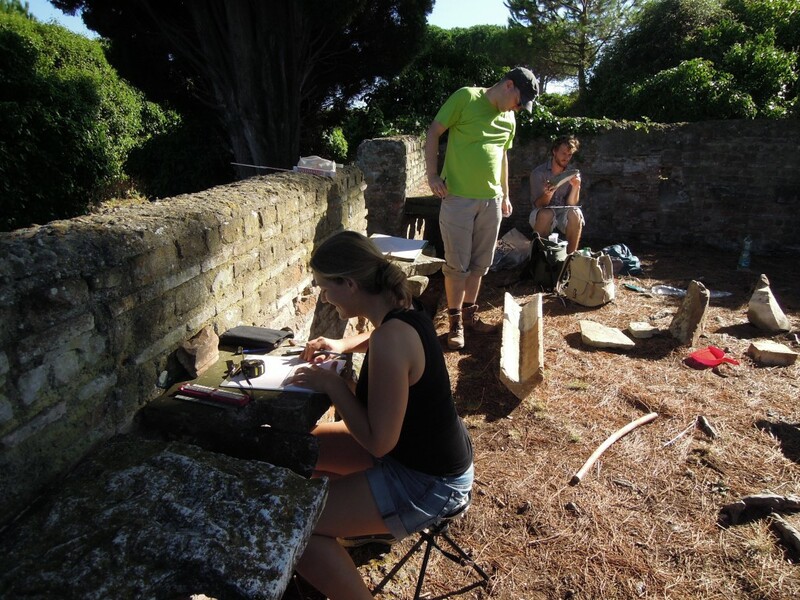 In the beautiful August heat of 2014, we started two weeks before the arrival of our „laserguys“ with the preparations of this southern part of the site for a proper surface- and wall-recording. 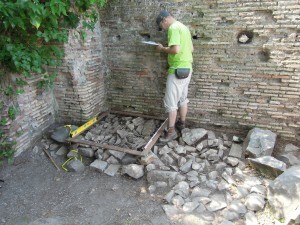 First step was an intensive spolia-survey in walls and floors, because we wanted to classify, measure and draw all architectural elements reused for late antique construction (spolia) in this area, before the complete digital documentation. We started with the semi-circular fountain with the central statue of a Venus, the so-called Ninfeo delle Venere (NDV, see picture above). Thanks to decent shadow, comfortable seating facilities and ergonomic „tables“ (the plaster-copies of ancient toilet seats), the famous late antique toilet behind NDV became our favorite place for drawing and describing all reused architectural elements in situ (LDV, compare pictures above, see picture below). The toilet LDV had two building-phases, both late antique. 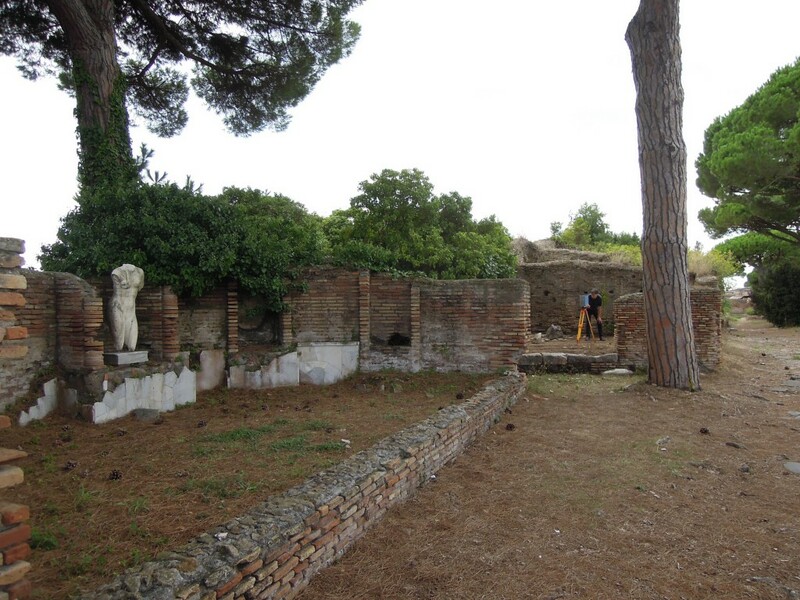 Due to our research on the local stratigraphic development in the fundament-layers, LDV represents the latest secular public building in Ostia: It was firstly built around AD 400 and completely rebuilt with a higher floor-level after the middle of the 5th century AD. The building LDV is in many regards an excellent example of reuse: All marble elements show traces of their first use, some as architectural decoration, the drains are roof-tiles from big Roman temples (see Ostian Marble Roof tiles – a Typology & picture below) and one toilet seat consists of the front side of a sarcophagus, which was flipped over so its maritime mythology stayed underneath. 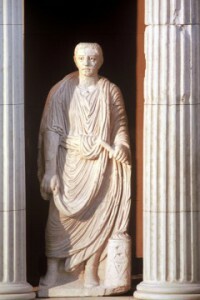 Even the toilet’s flushing-water once had been “recycled”: It came from the water-supply, which first flushed the feet of Venus in the fountain NDV, before it entered the toilet-channels. 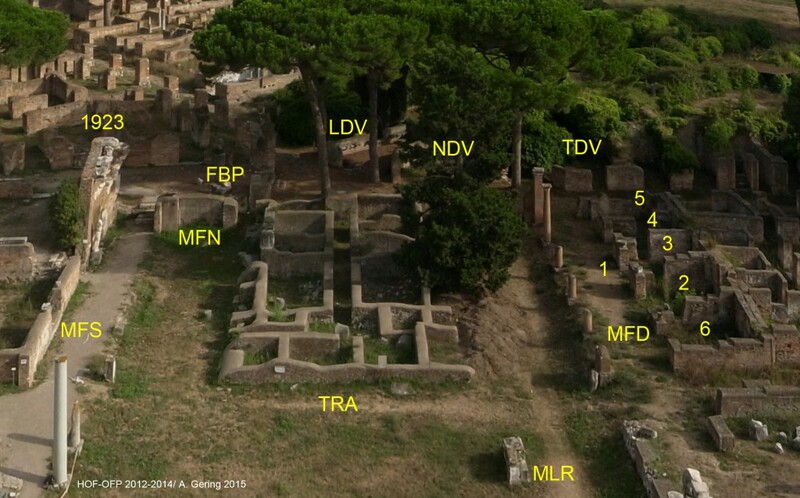 After finishing the architectural drawing of LDV and its spolia by hand, we extended our working program already in the first week to the corner-room at the south side of the Forum, which was called, due to its famous neighbour, “Taberna della Venere” on our map (see plan above: TDV). First step was to clean the room from its only two years (!) old jungle-like vegetation (see pictures below). Though we had partially cleaned the original surface in 2012, we felt as if we were back in 1923, when the room was first excavated by Raffaele Finelli and some workers under the direction of Guido Calza. To our big surprise, the room was only excavated to a certain extent in 1923, which we did not fully understand – neither in 2012, when we first analysed the room, nor in the beginning of the 2014 campaign. In the southwest corner of TDV, we had found some interesting spolia pieces, piled up inbetween and underneath numerous little fragments of simple marble slabs. 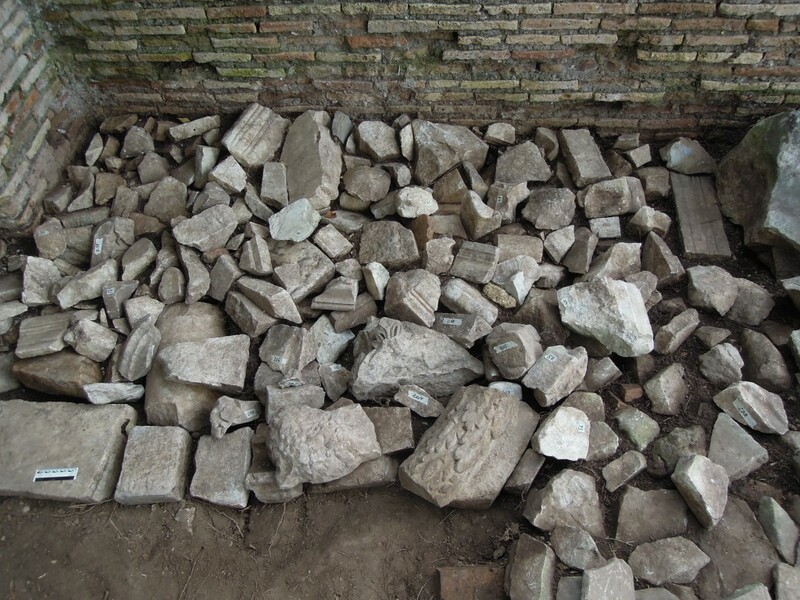 This pile of stones was guarded by approximately one scorpio-family per stone, who we carefully relocated in other rooms further west (see pictures below). Our first hypothesis regarding the marble-pile was quite pessimistic: Was it a relic from either a lime-kiln in the 1830’ies, the excavator’s piles from the 1920’ies or even piles from an Italian working campaign around 2005? 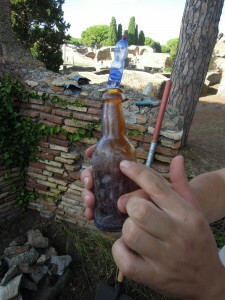 Even after our fine-cleaning and the 3-D-documentation of the marble-pile, the main question remained open: Was it a rather recent pile from the hasty 1923 excavations – an evidence could be several old Peroni bottles (see picture below), which were found directly on top of the antique surface that we had re-cleaned? Or could this pile, at least to a certain extent underneath a disturbed or completely modern surface, be antique? 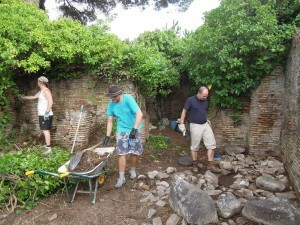 A common problem in Ostia’s city-centre is the long – and mostly undocumented – excavation- and conservation-history from 1801 to at least the mid 1970’ies. Just by documenting the surface, we found lots of evidence of these former excavation activities on one hand, and hardly any remains of undisturbed late antique surface-stratigraphy on the other. It seemed to us that the main question, „antique or not“, could only be solved by analysing the single marble finds individually with all kinds of available methods. By examining the surface with special photographic techniques focussing on the stone structure, and by drawing each fragment by hand in a slow and careful way, we indeed found clear evidence showing deliberate cutting processes of the formerly bigger marble pieces into fragments, which happened before a certain patina evolved. 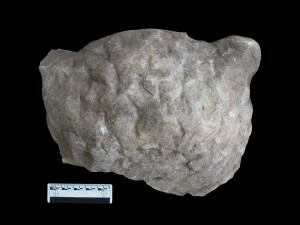 Was this the proof we were looking for to understand the whole pile of stones with its missing stratigraphy? By further analysing the content of the marble-pile, we found more and more different original contexts: Partly broken workshop-pieces, which were left unfinished, because of their structural damage, and marble fragments of all possible origins, like specific thresholds from upperfloor flats, architectural elements from the Forumsbasilica, the so-called “Curia”, from marble temples, statue-bases, statues, or single monuments or dedications from public plazas or sacred areas a. s. o. 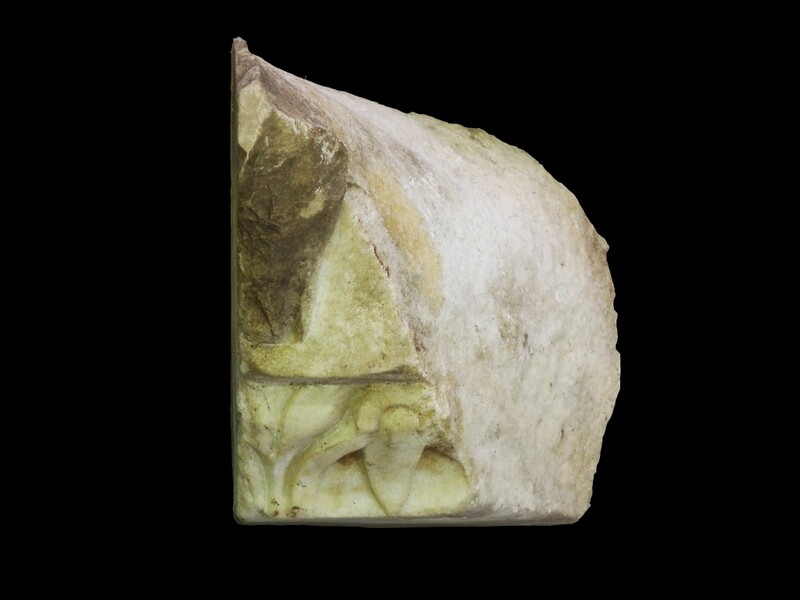 Accompanied by all kinds of doubts, we came to the conclusion that all marble fragments had more or less in common that they were artificially cut into certain sizes, which mostly seem ideal for burning marbles into chalk in lime-kilns. 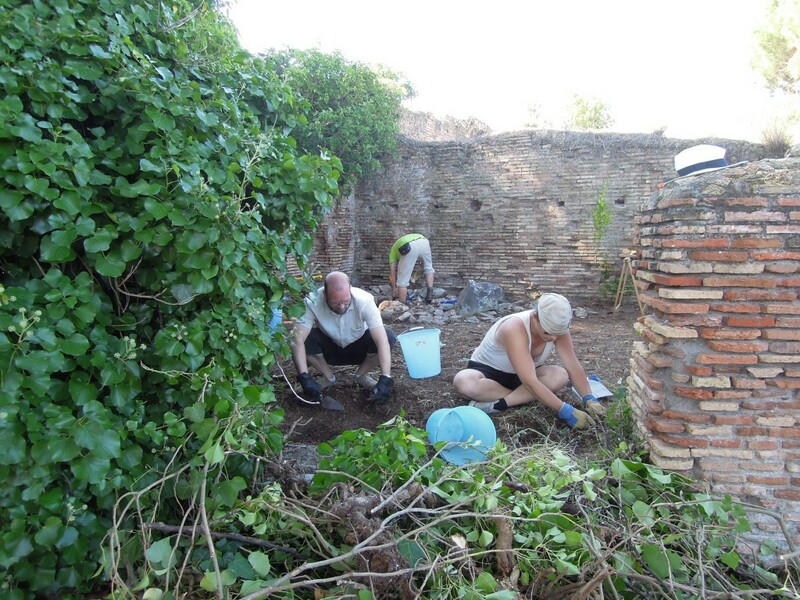 And lime-kilns seemed an exclusive phenomenon of the early Middle Ages, before the Forum (the last preserved coins on the plaza’s lower level date from Fokas – early 7th century AD) was covered by meters of earth from the vegetation. These meters of earth were first removed in 1801-1804/5. 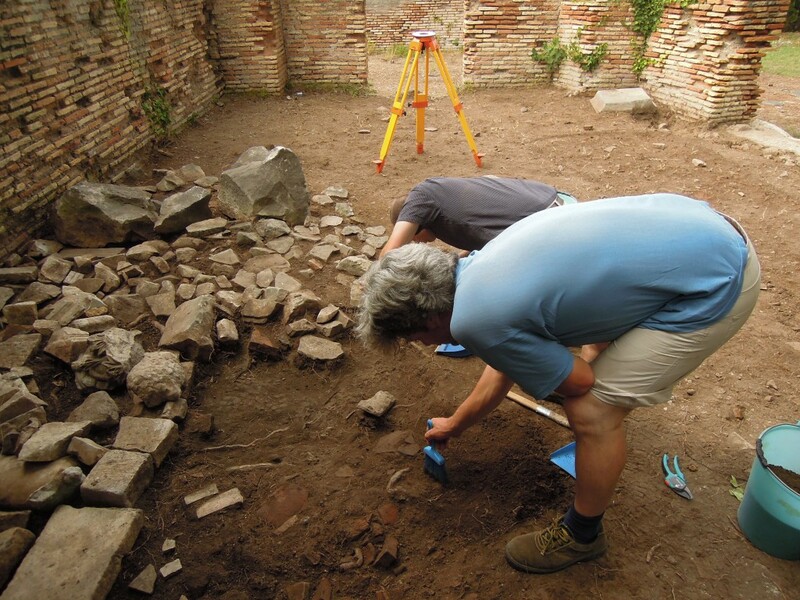 But it can be excluded that the excavators themselves burned their finds in lime-kilns. 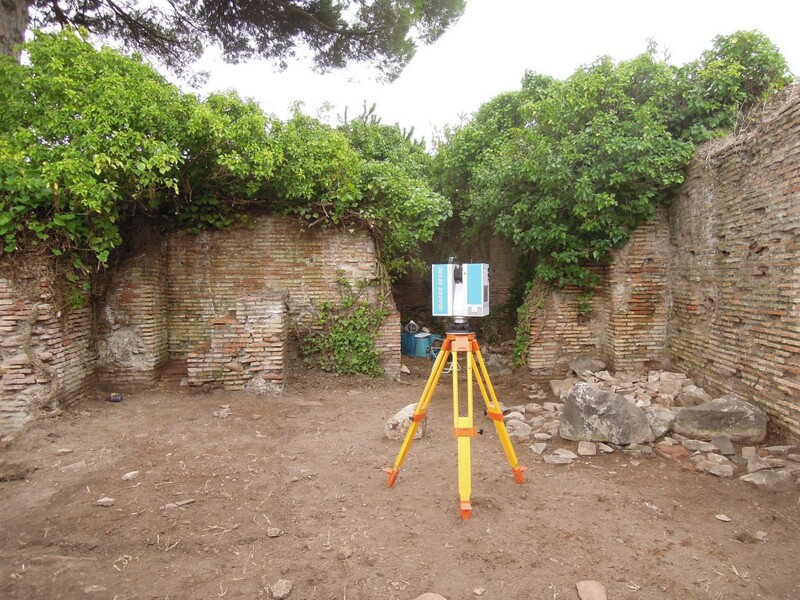 However, Ostia’s city-history proved to be more complicated: Indeed there was a short return of lime-kilns in the first half of the 19th century, following the first excavations of 1801-1804/5. Vaglieri discovered a lime-kiln of the 1830’ies in 1913: photos from 1913 still show white-ish chalk inbetween the Capitolium’s marbles. We assume that this example could really have been one of this rather modern lime-kilns, which was left half-burned, due to the fact that this business was abandoned after a few years by the Pope’s order. Fortunately, due to the limits of the old excavations from 1801-1804/5, our room, TDV, has remained untouched and covered by meters of earth until 1923, which means that no 19th century lime-kilns could have been responsible for the existence of our marble-pile. Independent of all initial doubts regarding its antique origin, we documented the pile with maximum care and all available modern 3-D-technology. 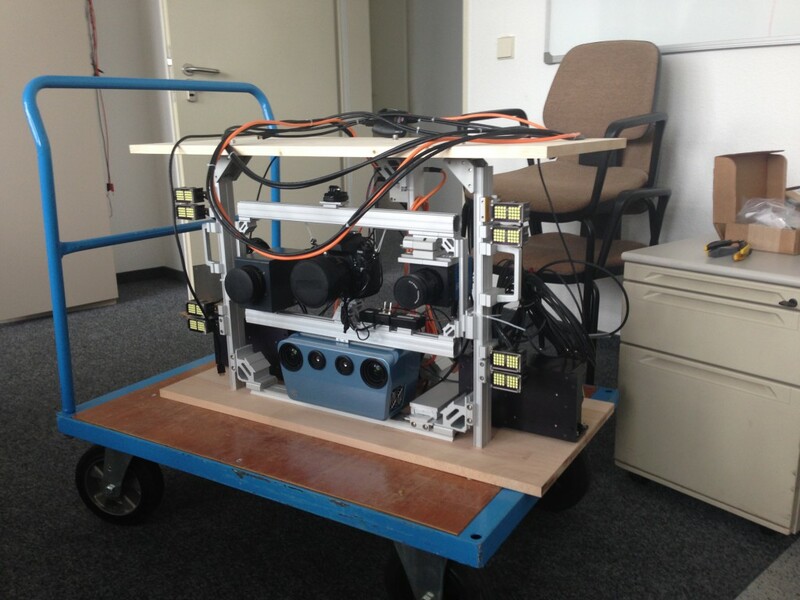 A new feature of this year’s campaign was the prototype of a photographic sensor, which was developed for biological or medical research in Bavarian laboratories (see picture below). The big advantage of this machine was its speed, which allowed us to take all pictures for 3-D-point-clouds by „making a movie“. The marble-pile was recorded in 3-D with laser-scanner and a rather usual Leica with 24 MP and special lenses (see pictures below). As complicated and disturbed the stratigraphy seemed during the first working-weeks, the content of the marble-pile itself was of an extremely high interest. 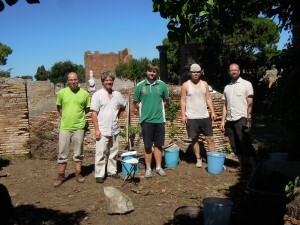 And questions regarding the original context of many architectural fragments could be solved immediately – one of the advantages, if you work in the middle of the ancient city itself, not in a library: Comparisons and analogies could be found easily just by strawling around the ruins of Ostia. 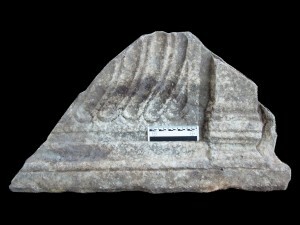 In 2008, we had found the first imprints of a sarcophagus in the mortar bedding of the Foro della Statua Eroica (FSE). 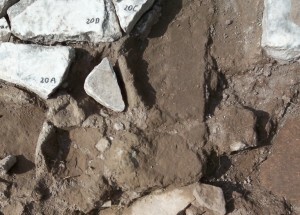 Material from pagan cemeteries was reused in the whole city, quite often as pavement slabs, but also as thresholds or as simple building material replacing bricks. Also, in our pile there were several fragments of sarcophags, partly flattened to be reworked for a different purpose, partly just broken fragments with similar patterns, which were left to fit into “patchwork”-floors of the latest phases (see picture below, left. 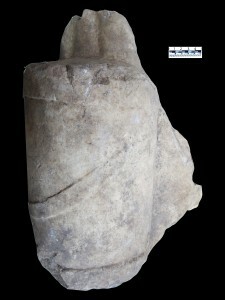 In FSE, the reuse is dated to the second half of the 5th century AD, see picture below to the right). 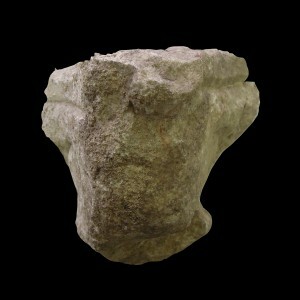 Another type of reuse was verified by the find of a „capsa“, a common attribute to statues, and, typical as flat and low-relief, especially for statues from pagan funeral monuments from the suburbs (see pictures further below), supplemented by a balustrade from unknown architectural contexts (see picture below, bottom). 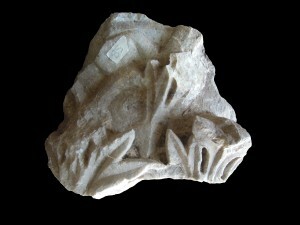 A main part of the marbles showed architectural decoration of a very specific style. 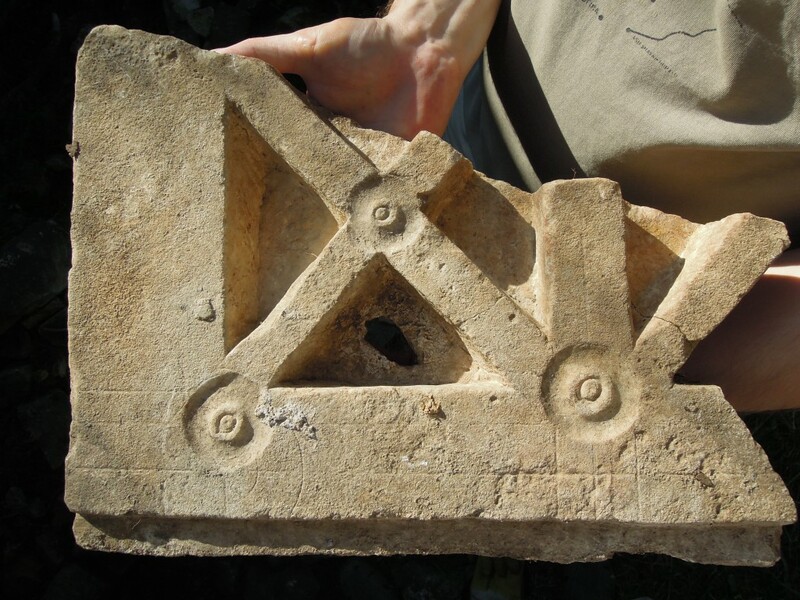 The first example we had found is characterized by an odd angle of 22° (see picture below), which is identical with the angle of the pediment of the Roma and Augustus temple (see pictures further below). 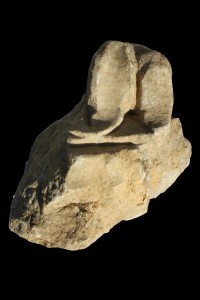 Could it be true that former excavators had left such high-quality pieces in the pile? 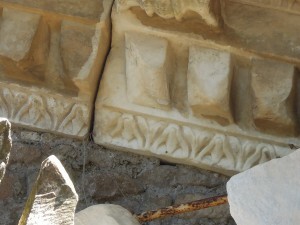 The fragment fits directly to the preserved kyma in the left part of the restored pediment: Why didn’t Gismondi use this fragment for his pediment-reconstruction of 1923 as well? Or did all former excavators, including Calza and Gismondi, miss this pile, because it was buried underneath a cover of low-value fragments of „excavation rubbish“? The list of fragments, which fitted to the pediment of the Roma and Augustus temple increased every day on site. Until the end of the campaign, we counted decorated fragments from more than 25 different parts of the temple, even from the less well-known areas of the temple door and its inside areas. 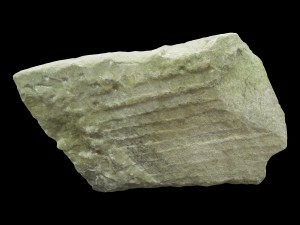 Many more pieces were part of the cella blocks with no visible decoration except some typical features of isodomic walls. 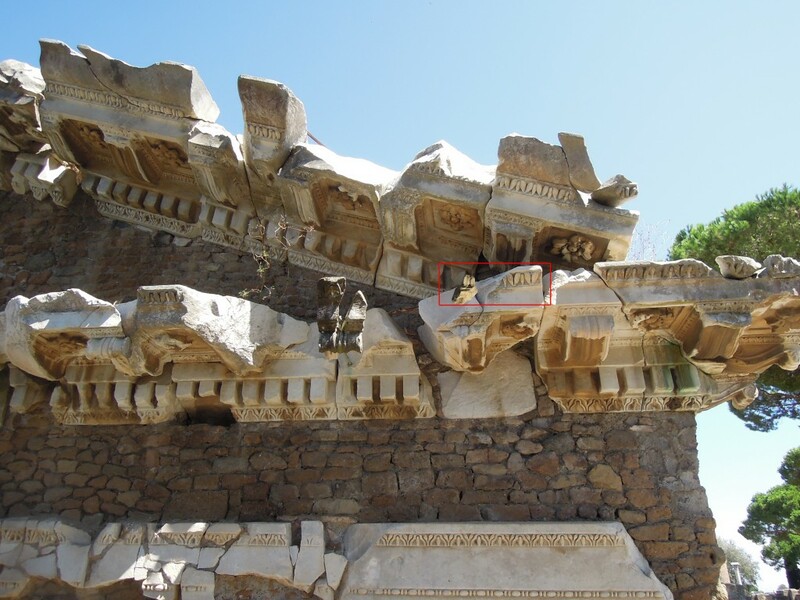 Some architectural elements were extremely fragmented, but still easy to be classified due to the reconstructed pediment located only a few meters away (see pictures below). A third group of material consisted of half finished decoration elements or so-called exercise pieces of an artisan’s workshop, verified by „senseless“ chisel marks or very uneven lines a. s. o. (see pictures below). 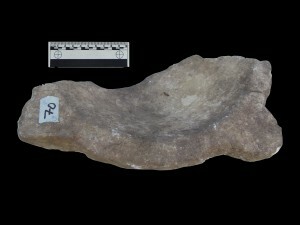 We found parts of a half worked Corinthian capital from the 1st to the 4th centuries and – last but not least – a half worked marble water basin, which can be frequently found in the context of early Christian churches in the 5th-6th centuries (see pictures further below. 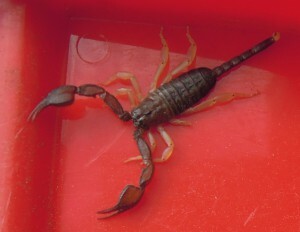 Earlier examples of this type exist, but are very rare). 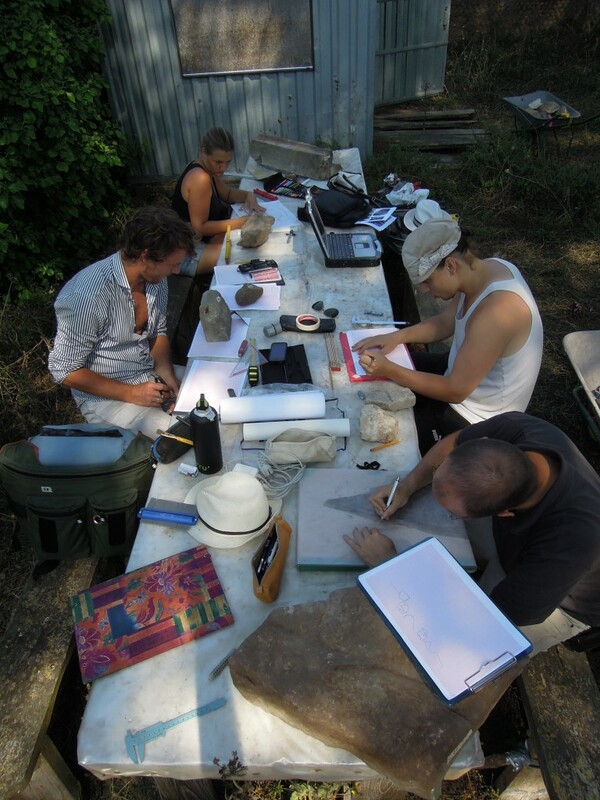 Drawing and describing these finds were reserved for one part of the team in the shadow (see picture above), while the others kept on documenting all features of the room TDV itself. … to be continued in chapter 2!